Click here to stream Magnetic Current. In hardened magma from eras past, layers of iron reveal their desperate history, each deposit reaching towards a different destination in its brief liquidity. This destination, however, has and always will be the same: the wayward North Pole as she makes her ceaseless, subtle trek across the globe. And then: these layers were ripped apart in terrible hours of quaking mayhem, as the continental plates awoke with fury. And now: these lost and lonely strata, matched at points a sea apart, illuminate the drift and separation of a once still and undivided world. 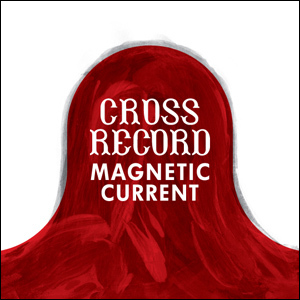 Cross Record is the project of Emily Cross, and Magnetic Current is her meditation on the paradox of life’s transition from the everyday to the otherworldly and back again. In this atmospheric rawness, the quickest look can be the longest glance, as the routine becomes a window to fleeting, yet profound worlds. This debut recording features minimalist explorations of the metaphysical, the unexplainable, and the ritual. Constantly drifting, constantly searching, Magnetic Current’s impermanence is the secret to its lasting impress. And now: primacy and consciousness; clarinets and cello; the gospel, the relic, the drone. ANC010 is out of print.